In the Hamptons where memberships at golf clubs can cost $600,000, where can you play without maxing out your platinum card? We caught golf expert and author Tom Clavin at the 19th hole to gives us the inside Hamptons golf scoop. In and around the Hamptons are some of the best golf courses in the world, including Shinnecock Hills, National Golf Links, the Bridge, and the new Sebonack Golf Club. That a course is private shouldn’t dissuade you from wanting to play it because some private clubs have late-day hours (usually after 3 p.m.) when the public can play or maybe you’re a cool enough person that a club member will invite you to play as his/her guest. But let’s face it, your best chance of squeezing in some rounds this summer is to hit a public golf course. There is not a lot available, so you’ll have to pick your spots and times. The good news is that public golf in the area is affordable. The best course is Montauk Downs State Park (631-668-1100). It is rather beautiful already, but a restoration is underway to make it even better for the eye as well as the golf skills. It was built in 1928 by Carl Fisher as part of his effort to turn Montauk into the “Miami of the North.” It fell into disrepair, was renovated by Robert Trent Jones Sr. and his two sons, Robert Jr. and Rees, then purchased by the state. The restoration, paid for with a combination of state funds and private donations, is being done pro bono by Rees Jones, who prepared Bethpage Black for the Open in 2002 and 2009. The greens fees on weekends and holidays are a paltry $41 for state residents, and an even better bargain at $36 weekdays considering that some golfers consider the Downs to be Pebble Beach of the Northeast. It is 18 holes, par-72, and is extra challenging when the wind is coming off the ocean. You must reserve a tee time in advance by phone, and obviously midweek late in the day gives you a better shot and getting on the course. 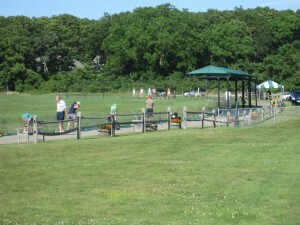 Right on Montauk Highway where Sagaponack meets Wainscott is the Poxabogue Golf Center (631-537-0025). Golf doesn’t get any more basic than this at only 1583 yards (two of the holes are less than 100 yards!) and par-30. But it has a newly renovated driving range, attached is the Fairway, a great breakfast and lunch eatery, and you can’t beat the price: $18 for the 9 holes, only $12 after 3 p.m. The course is owned by the Towns of East Hampton and Southampton. The Sag Harbor Golf Club (631-725-2503) had been a well-kept secret for decades but, alas, that is changing. It is a state-owned course so the greens fees are reasonable — $24 on weekends, $16 during the week. It’s a 9-hole course but for that price the second 9 is free (unlike Poxabogue). It’s more challenging at 2732 yards, par-35, with the dogleg par-4 6th hole being almost as tough as anything you’d find at Montauk Downs. If you like beer, the clubhouse is the place for you . . . okay, as well as holes 1 through 9. No driving range but there is a putting green. Avoid Saturday and Sunday mornings when the wait can be over an hour; pre-sunset golf is the best. The North Fork is a wonderful place to visit with its farm fields, vineyards, and rugged coastline. Take your golf clubs and head to Island’s End Golf and Country Club (631-477-0777), right on Route 25 in Greenport. 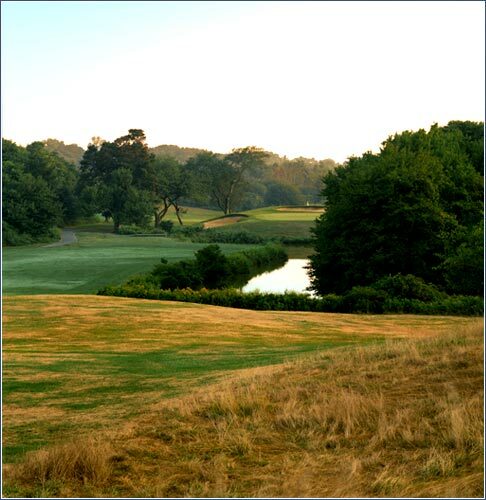 It too has reasonable rates for 18 holes at par-72 for 6639 yards adjacent to the Long Island Sound. 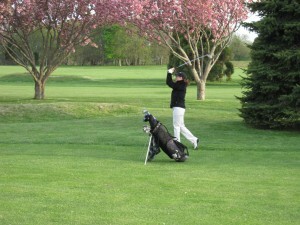 In Riverhead is the Long Island National Golf Club on the Northville Turnpike (631-727-4653). This course opened only 10 years ago, but it has a great pedigree, having been designed by Robert Trent Jones Jr., one of the top golf architects in the world. It was built on farmland, and bordering one side is a working potato farm. It is quite a test at 6838 yards from the green tees and being only a par 71. So if you’re out just for the season or are stealing only a week in the Hamptons and have your clubs with you, think public courses this summer . . . and over the winter, make friends with members of the private clubs. Tom Clavin is the author of Sir Walter: Walter Hagen and the Invention of Professional Golf, Dark Noon, Halsey’s Typhoon, and The Last Stand of Fox Company. If you get hit in the head with a wicked slice, it wasn’t him.